The advantages of conferences and meetings include discussion, presentation, and collaborative opportunity of new information which may be unavailable in traditional literature sources. These meeting and conferences have been crucial to the scientific and business discourse, leading to new collaborations, enhanced discovery, and provided platforms for young scientists and companies to publicize their work in an interactive forum. However, these advantages are mainly limited to meeting attendees, while feedback, collaboration, and meeting impact is difficult to assess. Social media and the networks it creates have revolutionized scientific collaboration and discourse. The use of social media could greatly enhance and provide metrics for meeting engagement, feedback, and effect on professional networks. 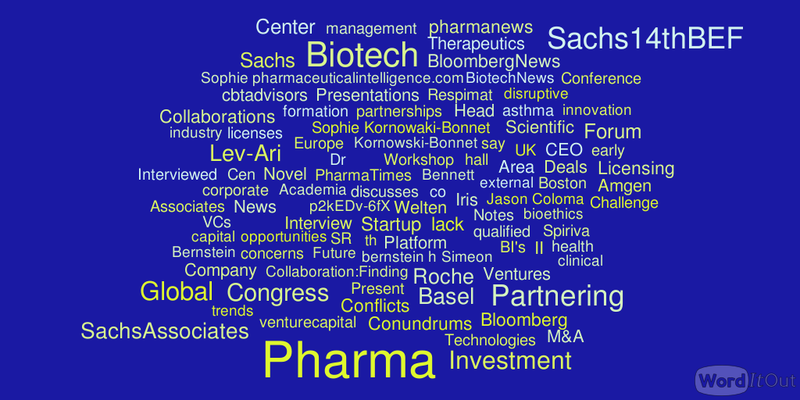 Here we describe results of meeting coverage of the Sachs Associates 14th Global Biotech Partnering & Investment Forum using a methodology described in Methodology for Conference Coverage using Social Media. 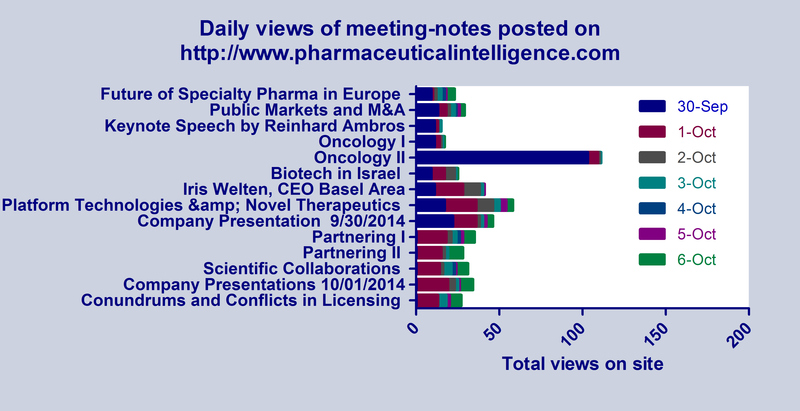 Briefly meeting notes are simultaneously posted on the site https://pharmaceuticalintelligence.com/ and the corresponding Twitter platform @pharma_BI, and coordinated with Sachs Associates meeting Twitter handle #Sachs14thBEF. This integration of Twitter and web-based blogging platforms allow measurement of meeting attendant engagement and social media coverage impact. Methodology for social meeting coverage had been described before in Methodology for Conference Coverage using Social Media. This methodology had been used for the previous Sachs Associates meeting held in Boston, MA in March 2014 however meeting and Twitter analytics had not been performed. For this conference, LPBI had actively monitored Tweets and web post views during and a week after the conference. Defining most popular # and @ to use for maximum Twitter following of individual Tweets. Developing a strategy pre-conference allowed for the rapid integration of appropriate Twitter handles for each presentation. The list of # and @ which were to be used was posted on our site https://pharmaceuticalintelligence.com/ before the meeting began. Posts for presentation notes were fashioned and saved in WordPress™ as drafts to allow for quick access, writing of meeting notes, editing, and posting to the web via WordPress™. In addition, post was pre-annotated with tags (for search engine optimization) and placed in appropriate categories for indexing in LPBI’s online journal. Seven days after end of meeting, the online response to meeting presentations was determined by analyzing the Twitter and blogging activity related to the Forum. 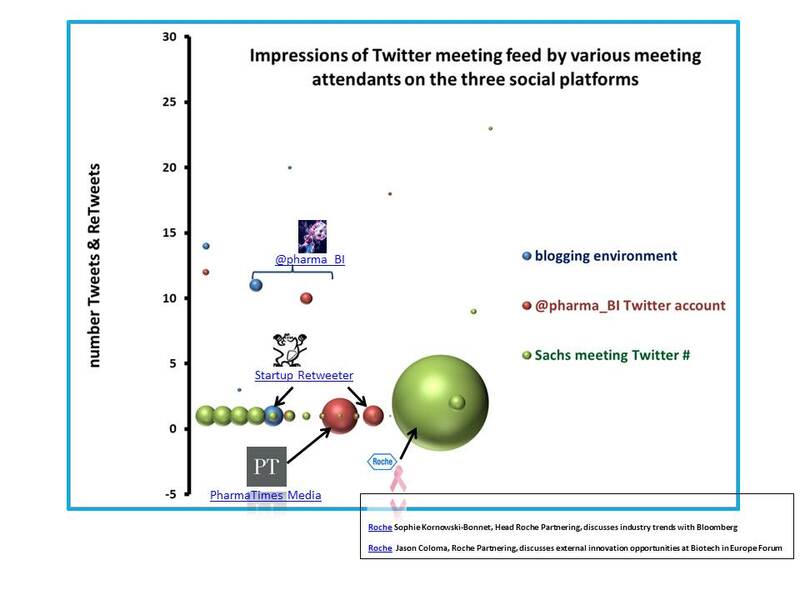 This was achieved by monitoring the meeting hashtag (#Sachs14thBEF), Twitter feeds related to the Sachs Associates (@SachsAssociates) Forum, Twitter activity from @pharma_BI (LBPI’s Twitter account) and web activity on https://pharmaceuticalintelligence.com/ , the WordPress site used to post meeting notes. Twitter Analytics Twitter feeds were collected from the three sources and analyzed using TweetReach™ (http://tweetreach.com/) analytic software. The number of tweets and retweets were measured as well as the number of Impressions and Reach generated by each Twitter user. The software org was used to analyze the Twitter feeds form either of the three sources of meeting coverage to determine the tweeting habits of meeting attendants based on size of social media following. 3. Word-cloud Analysis – Meeting tweets were collected into Word and saved as a text file. The text file was edited to remove redundant phrases such as html code. The resultant text file was analyzed using the WordItOut™ program, available at http://worditout.com/ and a Word-Cloud was generated to determine common words, phrases. Sachs Associates special Twitter Hashtag #Sachs14thBEF. Twitter feeds were collected from the three sources and analyzed using TweetReach™ http://tweetreach.com/ analytic software. Reach generated by each Twitter user. the largest bubble is from the user of @Roche. Reach is the total number of estimated unique Twitter users that tweets about the search term were delivered to. Exposure is the total number of times tweets about the search term were delivered to Twitter streams, or the number of overall potential impressions generated. “Impression”, we mean that a tweet has been delivered to the Twitter stream of a particular account. Not everyone who receives a tweet will read it, so you should consider this a measure of potential impressions. Both reach and impressions should be treated as directional metrics to give you an idea of the overall exposure the tracked term received, giving a sense of the size of potential audience and impact. Figure 2. Tweeting habits of Twitter users may depend on size of Twitter following. The software hashtag.org was used to analyze the Twitter feeds form either of the three sources of meeting coverage. Most who tweeted about the meeting had less than 1000 followers. HOWEVER there were some heavily-followed Twitter accounts who used the meeting hashtag #Sachs14thBEF. Figure 3. Daily views of each post of meeting-notes from Forum presentations. Presentations notes were posted on https://pharmaceuticalintelligence.com/ by Dr. Aviva Lev-Ari on day of talk as soon as the presentation ended. Statistics of post views were obtained using WordPress™ Toolkit. Different colored bars represent post views for the given day. Note the Oncology II presentation had 111 views form September 30th-October 6th. Certain talks were on day 2 of the Forum (October 1st). Below is a WORDCLOUD generated from a curation of the meeting tweets on ALL platforms. Some interesting words reflected some common themes at the meeting including conundrums, concerns with partnering and access to investment as well as Issues regarding Collaborations and Venture Capital.